ADSTRA SYSTEMS has introduced the ADSTRA Imaging Viewer, which the company claims allows users to easily view and share ADSTRA Imaging images. The Viewer is available as a free download from www.adstra.com. The ADSTRA Imaging Viewer allows users to view images created in ADSTRA Imaging as well as other formats (TIFF, JPEG, BMP, etc.). 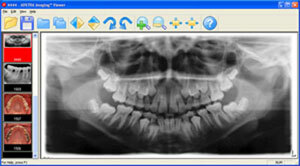 According to ADSTRA, the images can be exported and sent to colleagues and dental labs, which can be very helpful when referring cases. Recipients do not have to be ADSTRA software users. They can simply download the free viewer from ADSTRA's website to be able to view the images. ADSTRA also says that the Viewer also contains tools that allow users to manipulate the images. Positioning tools allow users to flip, mirror, rotate 90+, and rotate 90-. Zooming tools allow users to zoom in, zoom out, fit to window, and zoom 100%. The ADSTRA Imaging Viewer also contains an integrated Help File.